This means that anyone walking into court for an OWI (Operating While Intoxicated) charge is automatically part of an “at-risk” group. This isn’t just a matter of perception; it’s a matter of fact. It’s also a fact that the court system believes this to be true, not because it’s familiar with all the clinical studies and that kind of stuff, but because of what every Judge observes day after day after day, and year after year. This isn’t the half of it, either. By law, before being sentenced by the Judge, every DUI driver must undergo a mandatory alcohol assessment. This is a written test, the answers to which are scored numerically, that is administered by the court’s probation department. 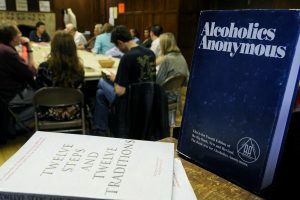 A person’s numerical score is then compared to a scoring “key” that essentially diagnoses where a person is on the continuum of alcohol problems, from not having one at all, to being a full-blown, last-gasp severe alcoholic, and everything in-between. One of the questions on every such screening test is whether or not a person has ever been arrested for an alcohol-related traffic offense (DUI). When a person answers “yes,” (as anyone who taking the test as a result of DUI arrest must do) that adds points to the score, because each such arrest carries a number of them. Thus, anyone in the midst of a DUI case starts out with a handicap. The other part of the problem is that these tests also ask if a person has ever been to AA. If someone answers yes to that, more points will be added to his or her total score. Thus, if someone has to add the points from a DUI arrest with those from having gone to AA , that’s drives his or her score high enough to be recognized as having a problem under any scoring key. Accordingly, any such person will be treated by the court as having a drinking problem. That will result in more breath and/or urine testing, longer probation, and mandatory AA or counseling, with consequences for missing. Consider this: if a person decides to see Carl the Counselor every week, on Thursdays, that’s great. If, however, the court orders someone to do that, and one day, the person decides to skip going to Carl because they get tickets to some special event, then that becomes a violation of his or her probation. By contrast, if the person was simply going to see Carl voluntarily, instead of under court order, then the worst thing that could happen for that “skip” is they’d get charged a fee for not cancelling the appointment within 24 hours. The underlying idea here, and in every kind of case, really, is to keep the court out of a person’s business and life as much as possible. There is simply no context in which more governmental involvement in someone’s life is better than less. Less is always better. If a person facing a DUI goes into the court system and makes it known that he or she has a drinking problem, or that he or she is seeking help for it, the court will, of course, be pleased to hear that, but it will follow up and turn that voluntary attendance at AA and/or counseling into a mandatory requirement, with penalties for failing to go. We don’t want that, either. Ever. The good news is that this particular problem really only arises in 1st offense cases. By law, 2nd and 3rd offense convictions carry mandatory counseling. In those situations, the strategy is different, and we’ll almost always disclose at least some of the help a person is getting. Think back to our earlier discussion of sobriety court. If a person chooses to go to AA for awhile on his or her own, why blabber on about it and risk having such attendance be mandated by the court? None of this happens if a person keeps these things to him or herself. Imagine, for example, that Dan the Driver is dealing with a 2nd offense DUI in a jurisdiction that neither has nor will transfer any of its defendants into a sobriety court (we can usually do that in most cases, but for purposes of this example, let’s assume not). Since Dan is going to have to do counseling anyway, rather than wait to get ordered into whatever program the court uses, he begins seeing someone of his own choosing. As part of his sentence, the court will almost certainly require that Dan remain in counseling until his therapist discharges him. That sounds okay, because it’s always better to choose your own fate than have someone else do it for you (remember, though, we pointed out that this is very different in a sobriety court situation, where the court will always direct where a person goes for counseling and/or treatment). However, what if Dan was also going to AA on a voluntary basis? If he makes that known to the court, the Judge is almost certain to order him to continue with that, as well. On the other hand, if he keeps that to himself, then he can continue to go if and when he wants without being under a court order that requires him to do so. Maybe this doesn’t sound like such a big deal, but what if, for any of a million reasons (maybe he gets a new job, or a new girlfriend), Dan decides that AA isn’t really for him anymore, and would prefer to just do his one-on-one counseling? What if he just wants to take a break? If he’s doing AA on a strictly voluntary basis, that’s perfectly fine. However, if he is under court order to attend AA, then not going becomes a full blown probation violation. To avoid that, he’ll just have to continue to go to meetings any number of times per week for the next year or two, even though he doesn’t want to. How long do you think he’ll go before just “not wanting to” to go turns into resentment for having to? What therapeutic value is in that, except the risk of a backfire? Always remember, success in a DUI case is always best measured by what does NOT happen to you. It is always my goal to help a client address any issues with alcohol in a way that works best for him or her while simultaneously avoiding or minimizing as many of the potential legal consequences as possible. If a client thinks he or she may have a problematic relationship to alcohol, we’ll evaluate that. If a client wants to talk to someone about his or her drinking, then we’ll examine how best to help him or her first, and then if we can use that to “help” the case, and, if so, how and when to do that. If you’re facing a DUI anywhere in Wayne, Oakland or Macomb County, and are looking to hire a lawyer, be a good consumer and do your homework. Read around, and then check around. All of my consultations are confidential and done over the phone, right when you call. My team and I are really friendly people who will be glad to answer your questions and explain things. You can reach us Monday through Friday, from 8:30 a.m. until 5:00 p.m., at 586-465-1980. We’re here to help.